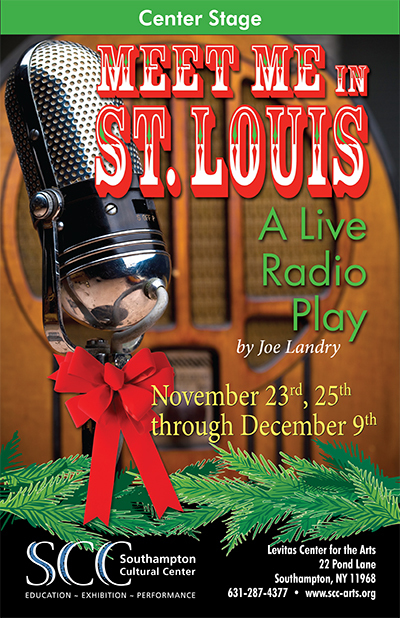 Center Stage at Southampton Cultural Center will hold open auditions for the Long Island premiere of Joe Landry’s Meet Me in St. Louis: A Live Radio Play on Tuesday, October 2nd and Wednesday, October 3rd at 6:00 PM in Southampton Cultural Center’s Veterans Hall. Auditions begin promptly at these times. Late arrivals will be seen at the discretion of the directors. Vocal and dance audition required. Readings from the script will also occur. Sides will be provided. Michael Disher directs. Amanda Jones musically directs. Alyssa Kelly choreographs. Performances will begin on November 23rd, 2018 and run through December 9th, 2018. Landry’s radio play is adapted from the book by Hugh Wheeler. Based on The Kensington Stories by Sally Benson and the MGM motion picture Meet Me In St. Louis, starring Judy Garland, Meet Me In St. Louis: A Live Radio Play features songs by Hugh Martin and Ralph Blaine, including the classics "The Boy Next Door," "Skip To My Lou," "The Trolley Song," "Have Yourself A Merry Little Christmas" and "Meet Me in St. Louis." LUCILLE BALLARD, a sophisticated and charming young lady seventeen – twenty.